A healthy crowd of 252 on a Tuesday night when Swindon Town were playing at home saw Supermarine beat Wimborne Town 3-2 at the Webbswood Stadium. Prior to kick-off, the stadium was bathed under a beautiful blood orange sky as the sun set behind the trees at the car park end of the ground. Last season, Supermarine played Wimborne three times, scored no goals, losing twice, but they did of course win the playoff final on penalties after a 0-0 draw at Cuthbury. By half-time on Tuesday night, it looked like a familiar story was unfolding once again as incredibly, the away side led 1-0 without even having had a shot on target, thanks to an unfortunate own goal by Jerel Ifil but despite being 2-1 down with eight minutes of play remaining, two goals in the space of just over 60 seconds won the game for Lee Spalding’s men. Matt Coupe returned to the team in place of Babz Jarra and Dan Williamson came in at right back for the injured Jon Else. Brad Hooper had the game’s first chance just seven minutes in when his rasping drive from the edge of the box was well parried away by Gerard Benfield in the Wimborne goal. Conor McDonagh forced the keeper into another good save with a similar effort ten minutes later. Michael Hopkins appeared to tweak his hamstring and received treatment midway through the first half that would eventually force him off at half-time. Nine minutes before half-time, the long ball nemesis came back to haunt ‘Marine once again.Benfield sent down an innocuous looking long ball that the back four let bounce and as Toby Holmes latched onto the ball in the box, he lost possession and as Ifil attempted to hook the ball to safety on the floor, he inadvertently scooped the ball into the back of his own net to give the visitors the lead. In time added on in the first half, Joe Shepherd rose highest from a Brad Gray cross and his firm header came straight back off the face of the post with Benfield beaten. Spalding reshuffled his pack at half-time due to injury, as Jarra replaced Ifil and Ryan Campbell came on for Hopkins with Connor Thompson moving back to left-back. Marine should have equalised early in the second half when Campbell curled an effort wide with his right foot before they did finally get their reward when Stuart Fleetwood looped over a cross that Benfield didn’t claim, and the ball fell right into the path of McDonagh who took a touch before guiding his effort into the empty net. In what almost looked like another carbon copy of a goal conceded in the last home game versus Farnborough, left full back Paddy Hester got down to the by-line behind the right-hand side of the defence and pulled the ball back into the box for the waiting Stefan Penny who steered his effort home from a few yards out. It was a hammer blow for ’Marine who had now conceded twice against the run of play from goals out of nowhere. Campbell went close again as he smacked both the post and crossbar with the same shot and as the ball went right across the face of goal, there was nobody there to bundle it in and another chance went begging. It looked like it wouldn’t be Marine’s day when Gray sent over a wonderful cross for Fleetwood who somehow headed wide with thirteen minutes to play. But it didn’t deter them, and they continued to dig deep and push for points. The game would turn on its head in two quick fire minutes as the front line won the game for the home side. With eight minutes to go, substitute Luke Williams won the ball in midfield, rode a heavy challenge and the ball fell to Shepherd who played it into Williamson who in turn laid the ball off for Gray and he worked his way into the box, shook off a couple of defenders before calmly rolling home the equaliser. A minute later, Shepherd once again played a lovely ball out wide to McDonagh who burst down the right and sent over a low cross that Fleetwood buried left footed past the indecisive Benfield for a deserved lead and the winning goal. It’s also pleasing to see the team turn a lot of these chances into goals, with eight in the last three games. A reward for hard work and perseverance. A late Magpies free kick on the edge of the box failed to cause any problems and the referee blew for full-time and it’s three games unbeaten now for Supermarine. 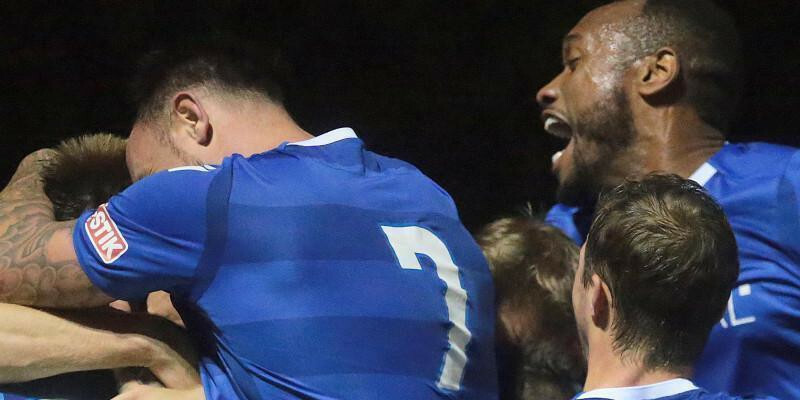 (Above) The players celebrate Stuart Fleetwood’s 83rd minute winner…. Conor McDonagh scores our first equaliser in the 52nd minute…. Brad Gray slides in our fourth goal and second equaliser in the 60th minute….